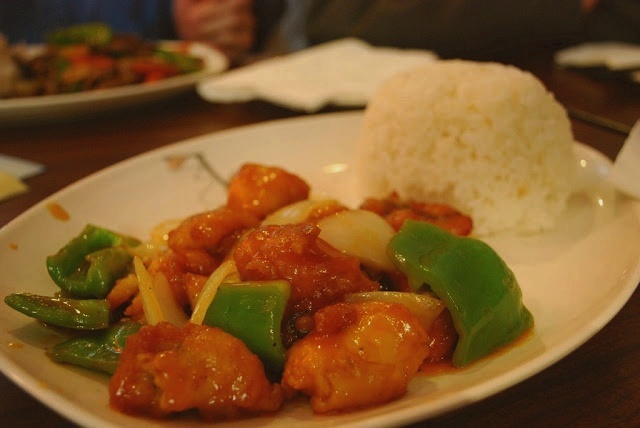 Sweet and Sour Fish Recipe. Crispy deep fried fish fillet and sweet sour sauce made with tomato sauce and vinegar. Quick and Easy steps. 1 egg, put in a bowl then beat it. Mix together fish ingredients in a bowl, then let it marinate for approx 30 minutes or more. Take a piece of fish at a time, wrapped with egg first and then flour (corn starch rice flour). Bring it to hot oil. Deep fry fish slices untill golden brown and crispy. Drain and set aside. In a pan, saute garlic, onion with little bit of olive oil under low heat for 5 minutes. Add water, tomato sauce, chilli sauce, plum sauce, vinegar, salt and sugar, stirring occasionally until sauce reduced. Add carrot, bell peppers, onion cube, tomato, mix it. Lower the heat. Add corn starch moderately to thicken the sauce. Turn off the heat. Pour fried fish to the sauce before serving. Do not over mixed. Serve dish immediately with other dishes and steamed rice.